Many organizational cultures today are Busy. Chaotic. Maxed Out. Stressful. Controlling. Disempowering. Business leaders wisely ask, Is our company profitable? It's a critical question. But have you ever thought to ask, Does our company bring life to the world? Do our companies serve God's kingdom as a Strategic Outpost? As followers of Jesus in the context of business, we can lead working communities who live and lead in a way that furthers Gods good and profitable purposes in this world. Wouldn't you love to be part of such a movement? So how do we transform our organizations? 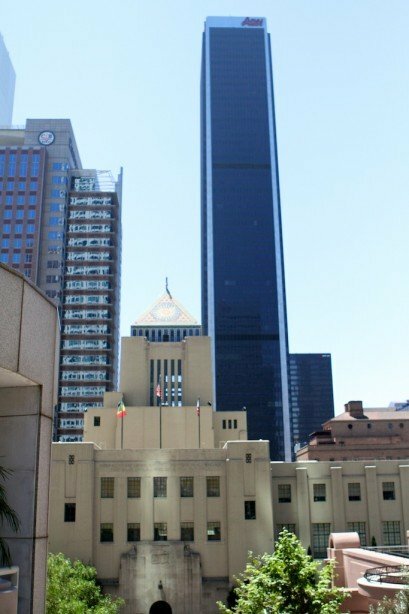 The Executive Leaders Journey is built on a 25+ year foundation of our successful spiritual formation and leadership development retreat process known simply as The Journey (http://spiritualleadership.com/journeyinfo). This community-based training process has proven very helpful with leaders at all levels of organizational oversight, helping you establish or deepen your own formational rhythms and integrating these rhythms into your leadership roles. The Executive Leaders Journey is more intentionally designed through personalized mentoring to equip those in positions of key leadership in an organization. This retreat process is a research-driven process that helps transform key leaders lives in such a way that the fullness of this transformation flows into your organization's leadership team as a whole and ultimately overflows into a transformed organizational culture. What you'll experience Diverse Community You will develop relationships with a broad spectrum of key leaders from a broad range of industries, and non-profit and ministry sectors. A secret sauce of this process has always been the cross-pollination that happens when you are able to bounce your successes (and frustrations) in creating transformational culture off of other, like-minded key leaders from diverse backgrounds. It never ceases to amaze us to witness the depth, creativity and wisdom that springs forth from these communities of leaders. Content & Interventions Drawing heavily from 20+ generations of The Journey to date, our interactive, praxis-based teaching model will move from establishing formational leadership practices for you, a key leader, to creating innovative, formational leadership practices for your leadership team and finally lead to organizational transformation interventions you can implement in your organizational culture. 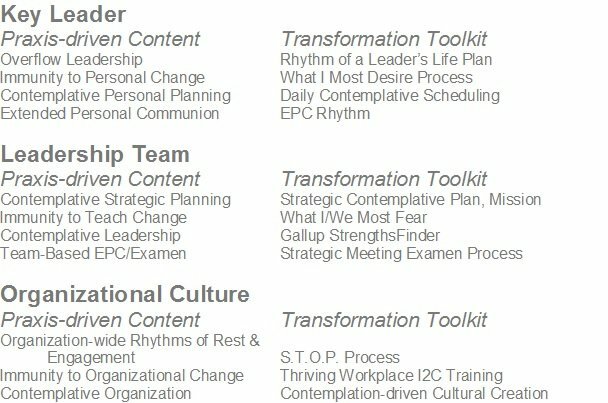 (Our Transformation Toolkit of practical processes that you can customize and embed in your cultural environment)Our leadership development and organizational transformation process is based on research from our 25+ years of experience in training leaders and organizational consulting we've done in academic, business and non-profit settings. We believe this movement from primarily focusing on individual leader development to organizational transformation is perhaps the most significant effort in our 25-year history. Please see below for a quick summary of our research-developed curriculum. THE FOUNDATION: The Executive Leaders Journey builds on the proven process of The Journey with intentional, rigorous and personal between retreat mentoring and organizational consulting from our key faculty leaders and organizational transformation consultants. You should expect at least monthly times of worship, prayer and mentoring within a mentoring cluster and at least monthly individual mentoring sessions. You must wisely discern your own time availability as well as your willingness to vulnerably go to places and depths personally God may be calling you travel with Him but expect that you may face significant resistance. Our Executive Leaders Journey process is intentionally personally and emotionally rigorous and potentially deeply transformative in the key leader's life. We strongly feel this is the only way to bring about true organizational change. You should expect 2 to 10 hours of engagement in community prayer, mentoring and on-your-own practices and study each month. *Group pricing available for 3+ member leadership teams or for advance payment. Inquire NOW by emailing troy@ tli.cc We would love to pray with you and connect to answer any questions you may have and to discern God's movement together.